Includes different types and sizes bits, plus a 1/4 inch adapter to use the bits in standard drivers. The bits are made from high quality S2 alloy steel and are heat treated, high hardness and long service life. Each bit resides in a removable plastic block to ensure the bits do not fall out of place. Comes with an anodized aluminum magnetized driver handle with ball bearing swivel top. 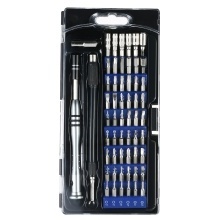 57 in 1 precision screwdriver set, great for repairing laptops, phones or other electronics work.